I have total envy for anyone with a natural talent or who has honed the skill of hairstyling. My ability to create different hairstyles is limited to about 4-5 styles and pretty basic ones at that. I mean I recently realised I’d been plaiting my hair wrong, after all this time and it was no wonder I couldn’t master the French braid, despite trying, many, many times. And yes, there really is a wrong way to plait your hair. So what if I can do a great blow-dry; when it comes to weddings, special occasions or even just creating something a little different, my skills fail. Thankfully, it is a skill that can be developed but at a point in my life when time is seemingly increasingly short or I find my brain is completely fried by the end of the day, learning something new is a particularly challenging feat. Although I am now trying out different things when I’m mindlessly watching T.V. or sat in the car for long journeys, there are times, like upcoming weddings, that I need a quick fix. Instantly intrigued by this one; the picture promised a fuller looking ponytail where the hairband sits. If you’ve got fine or thin hair, you’ll know the struggle; you either have a full ponytail and the smallest knot where the band sits making the style almost comical or it’s hard to create anything significant at all. The pack simply contains a rubbery volumising tool and a few hair bands. The instructions looked simple enough so gave it a whirl. I was immediately impressed with the results my ponytail looked thicker, fuller and healthier. It gave the ponytail a nicer shape and because of the instant lift it suited my face more because there seemed to be more of it. It really was simple to use too- you pull half of your hair upwards and secure the rounded side (so it slopes downwards) flat against your head in the centre of the gathering; you then gather the rest of the hair around the tool and secure twice with the band. 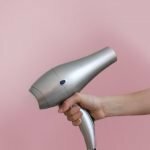 Depending on your hair type you may want to use a brush to achieve a smooth ponytail but with a little practice (and I mean a few minutes), it’s pretty easy to juggle it all. If you want to hide the band, the tool makes it super easy to wrap and secure hair around the band (which you pull from underneath the ponytail). This one looked like it was my answer to saving a lot of money; I had a 50’s/vintage themed wedding to go to and wanted to get into the theme as much as possible, including replicating an iconic hairstyle. I thought I was going to have to go to the hairdressers to have my hair set and then styled, which as we know, can cost a lot. But then I saw this, and with a few weeks to go I was certain, I could work it. The reality? They’re pretty difficult to work with. Essentially the rolls are like Velcro rollers/volumising tools that in theory you should just wrap around your hair, roll upwards and secure with pins; but if you’ve got fine hair, you’ve not got much to work with and all you end up with is a tight roll, not in keeping with any theme and you look like you’re wearing rollers. Not the desired look at all. I am getting better with each attempt but it is one that is and is going to take quite a bit of time and patience to get use to; you need to master structuring the hair around to disguise the rollers, whilst rolling them upwards and at a slight angle and then attempt to secure it as best as possible. I’ll keep going with it but don’t hold much hope. If you want to give it a go, here’s my tips- roll with the smaller end of the rolls towards your nose- there is a clear thick and thin side to them and they’ve not specified in the instructions which needs to sit where; we found it easier to work with it this way round. Also, the bobby pins with them are not worth using, you need stronger ones so bear this in mind. They show three styles that you can create with this set; the French Twist, Hollywood Roll and Bun. You’ll likely have seen a multi styler tool before, they’re commonly used to create buns but not seen them used in the other two styles before. As it looked like it would add volume to my style, I was keen to try it. It’s always about volume! We’ll start with the bun- the easiest style to replicate and easy enough to follow from the instructions. To make it even easier, I would spread the hair over the doughnut (as they call it) and then wrap another elastic band over the hair to secure. This will allow you to tuck in the ends with ease without concern about losing the shape before securing with pins. I found this just made it that much easier. 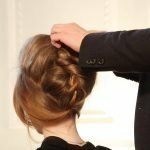 For both the French Twist and Hollywood Roll- both hands are essential in replicating these looks, particularly if you’ve mid-length/long hair. Use one hand to hold the hair taught and the other to use the roller; the one hand will work the roller the other continues to hold and structure the hair around the piece. It gets trickier again when trying to wrap your hair around the ends of a tight roll but secure first then come back to tidy it; you will need more pins. It’ll take a few attempts (3-4 in the space of minutes) but the end result is really lovely; I was very impressed. I had a tool similar to this when I was a child so that we could create the ponytail twist. 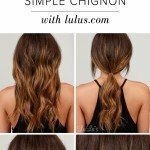 It made for an effortless, yet cute take on the traditional ponytail and was really simple to achieve- so much so that I no longer need a tool to do it. However, I’d never considered using such equipment to work on braids and as from my earlier story; clearly, I could do with some assistance in this area. I loved the cute compact case it all comes in; it’s two braid/twist tools, one small, one big and 5 clear plastic elastics with instructions for creating four styles. All of them quite like the original ponytail twist but the smaller tool allows you to create additional side braids. I found the braid twists a little fiddlier to work with mostly because you need to practice at it to hid the elastic bands but actually I quite liked the result, particularly that of the side twist which looks really cute, sitting just above the ear on a side parting (the side where the hair is at its thinnest). I think with a bit of practice you could create various braid styles such as halos, full ponies etc. Most effortlessly was of course the ponytail and waterfall twist; the waterfall twist essentially is the ponytail twist but with a half a head of hair, a little deceiving to the illustration in the picture but again I think with a little bit of practice working with the elastics it would be easy enough to replicate an actual waterfall braid. Still looks sweet regardless though. Overall I really this tool because it gave my hair another dimension pretty easily; I am not a massive fan of the clear elastics but then who is. If you can get away with it, use a much more friendly hairband to work with- although these are pretty essential for the side braids/twists, I think it would be simple enough and probably look nicer to work with something else anyway.